Write Accelerator is a disk capability for M-Series Virtual Machines (VMs) on Premium Storage with Azure Managed Disks exclusively. As the name states, the purpose of the functionality is to improve the I/O latency of writes against Azure Premium Storage. Write Accelerator is ideally suited where log file updates are required to persist to disk in a highly performant manner for modern databases. Write Accelerator is generally available for M-series VMs in the Public Cloud. Write Accelerator should be used for the volumes that contain the transaction log or redo logs of a DBMS. It is not recommended to use Write Accelerator for the data volumes of a DBMS as the feature has been optimized to be used against log disks. Write Accelerator only works in conjunction with Azure managed disks. Enabling Write Accelerator for the operating system disk of the VM will reboot the VM. To enable Write Accelerator to an existing Azure disk that is NOT part of a volume build out of multiple disks with Windows disk or volume managers, Windows Storage Spaces, Windows Scale-out file server (SOFS), Linux LVM, or MDADM, the workload accessing the Azure disk needs to be shut down. Database applications using the Azure disk MUST be shut down. If you want to enable or disable Write Accelerator for an existing volume that is built out of multiple Azure Premium Storage disks and striped using Windows disk or volume managers, Windows Storage Spaces, Windows Scale-out file server (SOFS), Linux LVM or MDADM, all disks building the volume must be enabled or disabled for Write Accelerator in separate steps. Before enabling or disabling Write Accelerator in such a configuration, shut down the Azure VM. Enabling Write Accelerator for OS disks should not be necessary for SAP-related VM configurations. The Premium disk caching must be set to 'None' or 'Read Only'. All other caching modes are not supported. Snapshot are not currently supported for Write Accelerator-enabled disks. During backup, the Azure Backup service automatically excludes Write Accelerator-enabled disks attached to the VM. Only smaller I/O sizes (<=512 KiB) are taking the accelerated path. In workload situations where data is getting bulk loaded or where the transaction log buffers of the different DBMS are filled to a larger degree before getting persisted to the storage, chances are that the I/O written to disk is not taking the accelerated path. The IOPS limits are per VM and not per disk. All Write Accelerator disks share the same IOPS limit per VM. 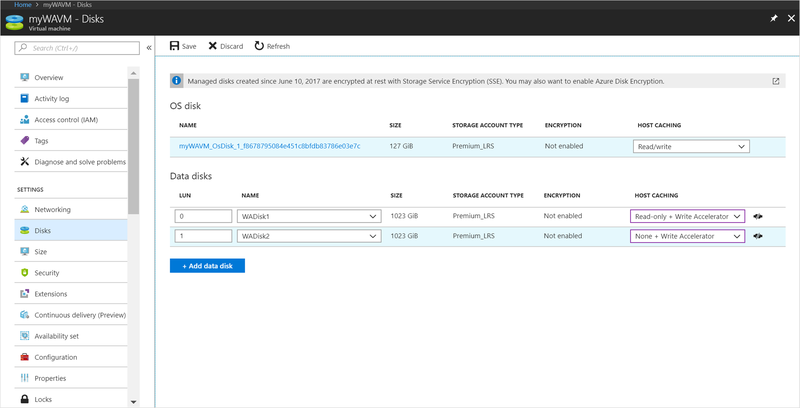 The next few sections will describe how Write Accelerator can be enabled on Azure Premium Storage VHDs. The disks you want to apply Azure Write Accelerator against need to be Azure managed disks on Premium Storage. The Azure Power Shell module from version 5.5.0 include the changes to the relevant cmdlets to enable or disable Write Accelerator for specific Azure Premium Storage disks. In order to enable or deploy disks supported by Write Accelerator, the following Power Shell commands got changed, and extended to accept a parameter for Write Accelerator. Not giving the parameter sets the property to false and will deploy disks that have no support by Write Accelerator. Not specifying the parameter sets the property to false by default, returning disks that don't leverage Write Accelerator. Specify either $true or $false to control support of Azure Write Accelerator with the disks. Two main scenarios can be scripted as shown in the following sections. You can use this script to add a new disk to your VM. The disk created with this script uses Write Accelerator. Replace myVM, myWAVMs, log001, size of the disk, and LunID of the disk with values appropriate for your specific deployment. You can use this script to enable Write Accelerator on an existing disk. Replace myVM, myWAVMs, and test-log001 with values appropriate for your specific deployment. The script adds Write Accelerator to an existing disk where the value for $newstatus is set to '$true'. Using the value '$false' will disable Write Accelerator on a given disk. You can use the Azure CLI to enable Write Accelerator. To deploy through Azure Rest API, you need to install the Azure armclient. To run armclient, you need to install it through Chocolatey. You can install it through cmd.exe or powershell. Use elevated rights for these commands (“Run as Administrator”). Using cmd.exe, run the following command: @"%SystemRoot%\System32\WindowsPowerShell\v1.0\powershell.exe" -NoProfile -InputFormat None -ExecutionPolicy Bypass -Command "iex ((New-Object System.Net.WebClient).DownloadString('https://chocolatey.org/install.ps1'))" && SET "PATH=%PATH%;%ALLUSERSPROFILE%\chocolatey\bin"
Replace the terms within '<< >>' with your data, including the file name the JSON file should have. Next, update the JSON file and to enable Write Accelerator on the disk called 'log1'. This can be accomplished by adding this attribute into the JSON file after the cache entry of the disk. The output should look like the one below. You can see that Write Accelerator enabled for one disk. Once you've made this change, the drive should be supported by Write Accelerator.